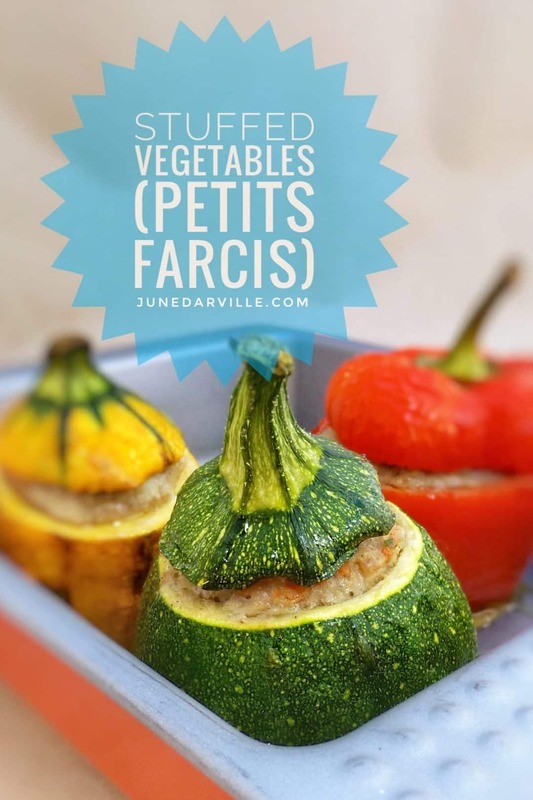 Stuffed Zucchini Recipe (French Petits Farcis) | Simple. Tasty. Good. 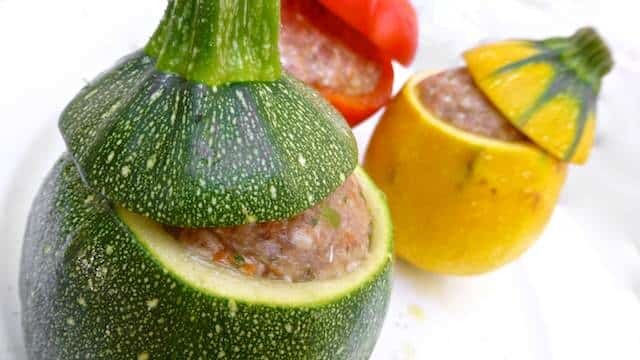 This stuffed zucchini recipe is based on a French classic also known as ‘petits farcis’, which means ‘tiny stuffed thingies’. I say zucchini but other vegetables such as tomatoes and onions are also used a lot as well. I added a red bell pepper to my recipe below to add extra color to the dish since I couldn’t find a suitable tomato that was good for baking. I found these tiny round zucchini at my local supermarket. Hadn’t seen these here before so I changed my dinner plans on the spot and went for petits farcis. 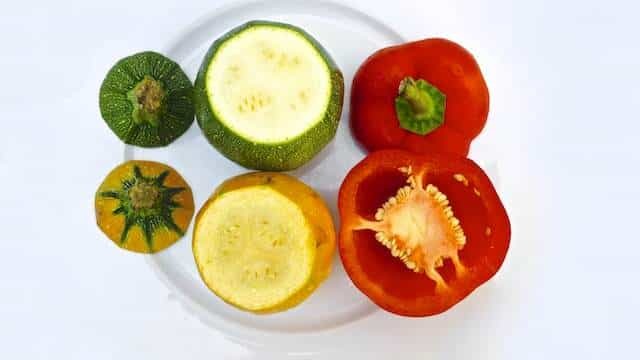 You can use long zucchini as well: slice the top off lengthwise in once or cut up the zucchini in 3 to 4 portions and remove half of the inside with a spoon. I served these petits farcis with pilau rice. Bon appétit! Love stuffed vegetables? Then also check out my stuffed tomatoes or how about some stuffed peppers! 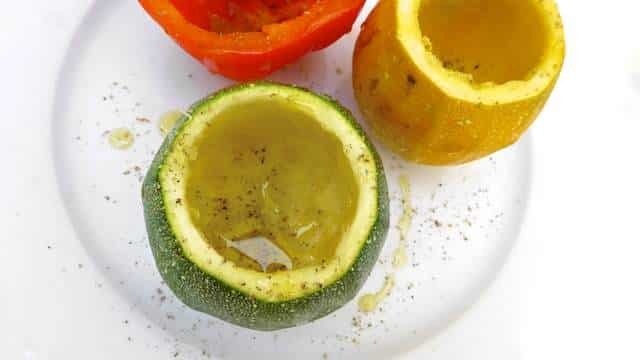 Slice the top off the bell pepper and zucchini. Clean and deseed the bell pepper. Then with a teaspoon carefully remove the inside of the zucchini. Drizzle the emptied vegetables with a little olive oil and a good sprinkle of pepper and salt. Peel, clean and trim the onion, garlic cloves, carrot and celery stalk. Then dice all of them up finely and add them all to a clean blender. 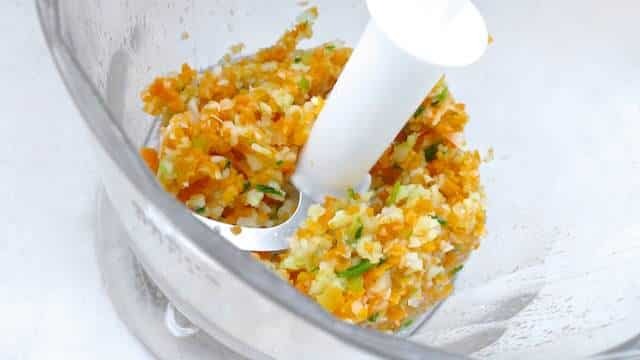 Blend until you get a fine vegetable paste. 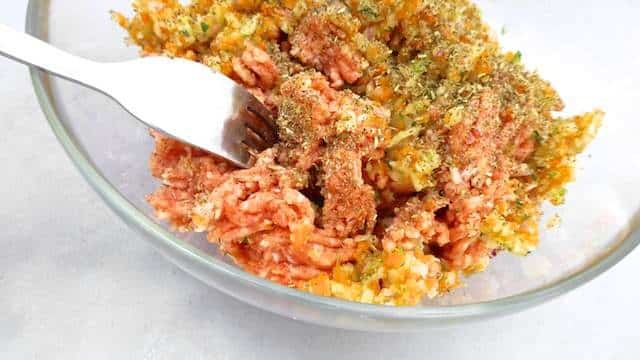 Pour the pork mince in a large mixing bowl and add the vegetable crumble. Season with the dried herbs and a generous pinch of pepper and salt. Mix all the ingredients up until well combined. 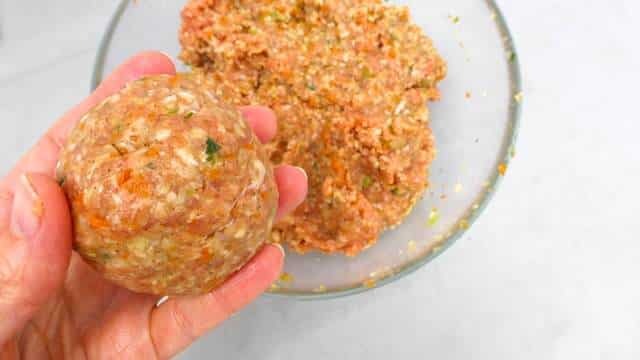 Then divide the mince into 3 pieces and roll each of them into nice balls. Stuff the meatballs into the cleaned vegetables and cover with the tops. Then transfer the stuffed vegetables to a baking dish and drizzle with extra olive oil. Bake the vegetables in a preheated oven at 356°F (180C°) for 45 minutes covered by a sheet of tinfoil. Then remove the tinfoil and bake the vegetables for another 15 minutes. Then remove them and serve hot. Here’s another colorful vegetable recipe! I bought these vibrant yellow and green zucchini at the local farmer’s market. When I saw them, I was sold right away. I didn’t have any idea what to do with them at first but I knew I had to bring out that brilliant color no matter what. Make sure the zucchini are about the same in diameter. If one is larger than the other, the towers won’t look as pretty and neat. I decided at the last minute to pop in some small sliced tomatoes as well. And the hats with the green crowns are the cutest part of these zucchini towers. You can roast them together but then the tomato will be wrinkled a bit. I topped the towers with the raw tomato hats right before serving. You decide. These colorful roasted zucchini towers with tomatoes and grated parmesan cheese are so easy to make... how cute are these?! Rinse the yellow and green zucchini and trim off the ends. Then slice the zucchini into thin slivers. Place the zucchini slices on a large baking tray and sprinkle them with pepper, salt, the garlic powder and the grated parmesan cheese. Slice the tomatoes as well. Keep the hats! 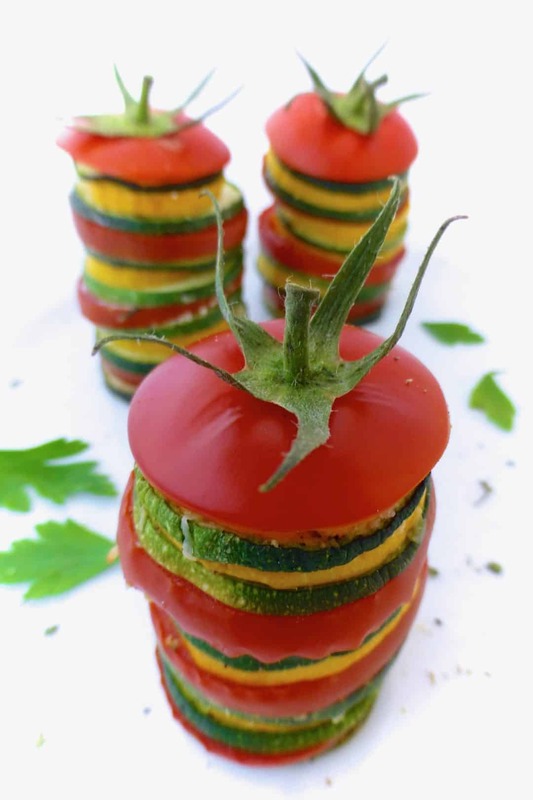 Then make colorful towers alternately mixing slices of yellow zucchini, green zucchini and tomato. Don’t make the towers too high. You should end up with about 6 to 8 towers in total, depending on how many people you intend to serve. Then place the finished towers in a baking dish. No need to sprinkle with olive oil. We’ll keep this vegetable side dish very natural and crunchy. Place the baking dish with the zucchini towers in a preheated oven at 400°F (200°C) for 45 minutes. Then turn the oven off but leave the zucchini in the hot oven for another 30 minutes. Then remove the baking dish and carefully transfer the towers to a serving dish or plate. Top the towers with the tomato hats and serve warm.